I believe that that is a false dichotomy. A mayor can pursue meaningful criminal justice reform while also ensuring public safety. I am the only candidate in this race that has a broad depth of experience in dealing with issues related to police brutality, accountability and police and criminal justice reform. My perspective on these issues stems from my roles as a federal prosecutor, the head of the former Office of Professional Standards, head of the Police Accountability Task Force (PATF), whose report served as the underpinnings for both the Obama Department of Justice (DOJ) report and recommendations on the Chicago Police Department (CPD) and the consent decree, president of the Chicago Police Board, and a board member of the Chicago Lawyers’ Committee for Civil Rights. My body of work demonstrates my commitment to ensuring that public safety is available to everyone and in every neighborhood, that officers must be held accountable for misconduct and that taxpayers cannot continue to shoulder the burden of unchecked misconduct manifested in settlements, judgments, and attorneys' fees currently totaling more than $500 million in the last seven years. As detailed in my 16-page public safety plan, I will continue and accelerate the pace of reform within the CPD, including implementing civilian oversight of CPD, ensuring officers receive training and resources spelled out in the consent decree, including more officer wellness resources, training police officers on interacting with youth, enlisting health professionals to serve as co- responders with CPD officers and expanding efforts to diversify CPD. 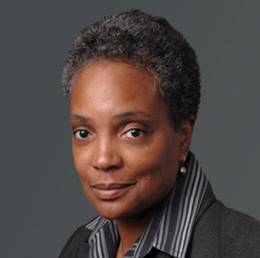 In an effort to further repair relationships between the police and the communities they serve, I will create a new chief diversity office for CPD, design a real community policing strategy that rebuilds what was lost when CPD disinvested in CAPS, undertake peace and reconciliation efforts, involve communities in police training, and require police recruits to participate in a two week orientation program in the first districts to which they are assigned. Yes. As mayor, I will continue to advocate for criminal justice reforms at the local, state and federal levels. I support efforts aimed at reducing prison and jail populations by keeping non-violent and low-level offenders out of jail while they await trial. As mayor, I will work with local, state and federal leaders, policing and criminal justice experts to identify ways to further reform the criminal justice system. As set forth in my detailed public safety plan, we cannot arrest our way out of our violence problem. Instead, the city and its partners must treat this epidemic of violence as the public health crisis that it is. This means addressing the root causes of violence by revitalizing economically distressed neighborhoods, ensuring access to quality schools in every neighborhood, eliminating food and medical deserts, and providing a pathway to good jobs that pay a living wage. In addition, we must follow the lead of cities like Boston and Oakland and increase the resources devoted to violence interruption techniques so we can stop violence before it happens. Furthermore, the city, philanthropic foundations and local businesses must place more emphasis on, and commit more resources to, organizations across the city that help ease the transition of the thousands of citizens released annually from state and county jails back into society and the workforce. Providing legitimate jobs that pay a living wage is one of the best ways to reduce violence and recidivism and improve our communities. To stop violence, we must also be much more proactive in stopping the flow of illegal guns that fuel violence. This requires a proactive, coordinated response from law enforcement that must be led by the U.S. Attorney for the Northern District of Illinois, in coordination with the ATF, FBI, DEA, the CPD and state and county law enforcement, as well as federal counterparts in states like Indiana, Wisconsin and Mississippi, from which large sources of illegal guns flow. We must target the traffickers, felons in possession and straw purchasers with an effective carrot (social service support and jobs for those who leave the criminal life) and stick (stepped up prosecutions for serious offenders) approach. In addition, the U.S. Attorney’s office must significantly increase the number of illegal gun cases prosecuted in Chicago. To ensure that the city has a comprehensive public health approach to addressing violence and overall public safety, I will create a Mayor’s Office of Public Safety, a first of its kind in Chicago. There are currently only two full-time personnel on the mayor’s personal staff devoted to the broad public safety needs of the city such as police, fire, homeland security, emergency management of natural and man-made disasters, and 911 and other emergency services. This is woefully inadequate, particularly when compared with the resources devoted by the mayors of New York City and Los Angeles. Competent stewardship of the city’s public safety needs and infrastructure requires a real commitment of resources and expertise. And that is precisely what I will bring to the job. We also must strengthen existing state gun laws, sign into law legislation regulating gun dealers, and support federal legislation that makes gun trafficking a federal crime. State legislators can strengthen existing laws to discourage straw purchasers and punish traffickers, as well as address problems arising from the failure to report lost or stolen guns, and the governor can sign legislation requiring gun dealers to certify their federal license with the Illinois State Police and take measures to protect against straw purchases. On a federal level, Congress can pass Representative Robin Kelly’s Gun Trafficking Prevention Act, which would make gun trafficking a federal crime and would increase penalties for straw purchasers. I do not believe there is a one-size-fits-all answer as to the appropriate length of incarceration and punishment for gun offenses in Chicago. As a former federal prosecutor and lawyer who represented, on a pro bono basis, people who had been wrongfully convicted, I know that context matters. Of course there is a role for incarceration and punishment as a deterrent for people who have committed gun crimes, as a deterrent for others, and as a demonstration to victims and the public that there is justice. When possible, we should use diversion programs for first-time offenders and low-level offenses. I also support eliminating cash bail—our jails should not be debtors’ prisons for the poor. I have long supported the work of the Chicago Lawyers’ Committee for Civil Rights and others to advocate for the elimination of this system. Lastly, must educate children about the dangers of gun violence to prevent these crimes from being committed in the first place..
3. DRUG POSSESSION: Local police have been on the frontline of fighting the adverse effects of drug addiction and the drug trade for decades. Despite massive efforts and expenditures to avoid the resulting negative impacts, more than 72,000 Americans died from drug overdoses in 2017. In metro Chicago in 2017, more people died from drug overdoses than from gun injuries. Despite generation-long efforts, both supply and demand for illegal drugs have remained functionally unaffected. Similar to the answer to the question above about gun sentences, there is no one-size fits all approach to this issue. As discussed above, I support a public health approach to addressing public safety issues. I also support providing opportunities for people to find employment in the legitimate economy, including individuals returning from county and state jails, so they do not have to resort to the illegitimate economy in the first instance. The police must believe and recognize that respectful, constitutional engagement with the community is their most powerful tool, and this needs to come through in their interactions with all Chicagoans, and especially communities of color. As set forth in my public safety plan, this can be achieved through rebuilding community-police relations and reforming police practices. I support the legalization of recreational marijuana, but I do not support decriminalizing possession of drugs like opiates and cocaine. Speaking more broadly, how would you rate the current state of deflection (which ensures people do not have contact with the system at all) and diversion (which attempts to remove people from the system that are already there) programs offered to Chicago justice-involved residents. I believe that deflection, where police and law enforcement act as referral sources to drug treatment and mental health services, is an essential tool that should and will be more widely used by local law enforcement throughout Illinois as a result of the passage of SB3023. Transparency, accountability, stakeholder participation and civilian oversight are essential to a successful, effective government, and this includes the Chicago Police Department (CPD). I have advocated for civilian oversight of CPD, which would provide transparency and accountability of JISC. In addition, a Mayor’s Office of Public Safety employing experts in public health and social services would be involved in overseeing JISC and ensuring that model principles are employed. I support civilian oversight of the Chicago Police Department, and I have come out in favor of many of the recommendations made by the Grassroots Alliance for Police Accountability. If I am elected, my administration will analyze how each city department, including DFSS, spends taxpayer dollars to ensure that they are being used efficiently and effectively. It is imperative that we reduce recidivism by helping people and communities. This means abandoning failed incarceration and rehabilitation policies and practices, and turning instead to evidence based programs with track records of success and policies that remove barriers to opportunity for people with arrest and conviction records. For instance, we know that among all re-entry programs, employment training/job assistance returns $20.26 on every dollar invested. We also know that recidivism rates decrease significantly when returning citizens have access to employment and safe, stable, and affordable housing. I agree that the city should expand efforts like those already underway at CTA to hire individuals with criminal and arrest records. The power of a second chance is something that I deeply understand. As the sister of someone who spent much of his adult life in prison, I know how important it is that we reduce recidivism by helping people and neighborhoods. This means abandoning failed incarceration and rehabilitation policies and practices, and turning instead to evidence based programs with track records of success, and policies that remove barriers to opportunity for people with arrest and conviction records. Annually, more than 11,000 people return to Chicago upon their release from prison. Among all re-entry programs, employment training/job assistance returns $20.26 on every dollar invested. We also know that recidivism rates decrease significantly when returning citizens have access to employment and safe, stable, and affordable housing. Access to stable housing is critical to reducing recidivism. Nationally, more than 10% of those coming in and out of prisons and jail are homeless in the months before and after their incarceration. The lack of access to reliable housing places huge strains on returning citizens and their families, depriving them of a necessary foundation for a stable life. Moreover, it has significant social and economic costs as returning citizens become homeless, cannot find work, re-offend and/or return to jail or prison. ● Draft and work to pass a “fair chance” ordinance that prohibits landlords from imposing blanket bans on renting to an individual based on his or her criminal record. Instead, landlords would be required to conduct an individualized analysis of an applicant’s conviction history, including whether the individual poses a threat to the public and the community, the amount of time since the person’s conviction, evidence of rehabilitation and other mitigating circumstances. Policies such as these not only make sense, but they move our policies into alignment with the Fair Housing Act and the Civil Rights Act of 1964. ● Reform Chicago Housing Authority (“CHA”) practices that discriminate against people with arrest records by prohibiting CHA from denying housing to individuals based on arrest and conviction records, and evicting people from CHA because of their records. ● Increase access to temporary housing so a person’s stay in jail or prison does not exceed his or her sentence. Many people remain incarcerated after their scheduled release dates simply because they have nowhere to go upon release. Rather than spend $143 per day to incarcerate a person, the city should work with Cook County and the state to invest this money into creating more temporary housing. ● Increase access to transitional housing so returning citizens who are waiting to get into treatment, education and/or job training programs have a stable place to live. The city can work with providers and other units of government to create and expand programs like the University of Illinois Health and Hospital System’s Better Health through Housing Initiative, which places people in “bridge units” until longer term housing arrangements can be secured. ● Improve access to permanent affordable housing. People with arrest and conviction records often face barriers to securing permanent housing, even years after their release. This issue will not be addressed until landlords and property owners are incentivized to lease to people with records, or until incentives are given to prospective property owners to purchase land or property specifically for mixed-use and mixed-income housing that includes slots for people with arrest or criminal records. No, I do not believe these goals justify the disparate impact on communities of color. Leadership begins at the top. As mayor, I will ensure that CPD engages in constitutional policing and does not engage in discriminatory practices like those outlined above, and that the city conducts a thorough audit of ticketing practices. Yes. Additionally, I support adopting standards to ensure that payment plans are affordable and accessible for Chicago’s most vulnerable drivers. The consequences of losing one’s license or being forced into bankruptcy based on an inability to pay fines and fees can be devastating and can significantly and adversely impact one’s quality of life and ability to seek employment. It is unacceptable that our ticketing system is having such a devastating impact on low-income people and people of color. To identify and address racial disparities, I will direct that an audit be conducted into potential bias in ticketing. Additionally, right now people who owe money to the city aren't allowed to work for the city or as taxi or ride-hail drivers. I would end this policy for people whose outstanding payments are below a certain threshold, and would seek to stop the suspension of drivers’ licenses for non-moving violations. Much of the substance of the consent decree reflects the findings and recommendations of the Police Accountability Task Force, which I chaired. While I support the consent decree, as I have said publicly, and as I outlined in a six page letter to Judge Robert Dow, the consent decree needs substantive changes. For instance, the consent decree does not address the use of chokeholds, firing into crowds or unchecked misconduct manifested in settlements, judgments, and attorneys' fees currently totaling over $500 million in the last seven years. As mayor, I will immediately take the following steps to ensure that the consent decree is effectively implemented: ensure sufficient budget, personnel and transparent accountability measures over and above the monitoring to ensure that we are making meaningful steps toward transforming the police department. I do not support Mayor Emanuel’s plan for the proposed west side police academy. It was not well conceived, not borne of a collaborative process with the community and there has been no discussion for how that investment can spur further economic growth. There is a need for a new facility, but I do not support this plan.